Up to 20 firefighters were continuing to damp down and reach remaining hotspots as dawn broke on fire-ravaged Eastbourne Pier this morning [31 July]. Fire chiefs said they would "scale back their efforts to recover damaged areas of the 144-year-old, Grade II-listed Victorian structure as the day progressed. At the height of yesterday afternoon's blaze, 80 firefighters were tackling the flames from the shore, the sea and from underneath the pier. East Sussex CFO Des Prichard praised the work of his crews in saving a section of the landmark after the fire from the amusement arcade building where the blaze broke out spread to cause substantial damage to other areas of the pier. "The hard work of our firefighters has paid off in that we have been able to save a section of this iconic landmark, but I know for the people of Eastbourne this will still be devastating." Sussex Police have said the pier was quickly evacuated, no-one was trapped and the fire was not believed to be suspicious. David Tutt, leader of Eastbourne Borough Council, added that the fire had been started by an electrical fault and it appeared firefighters had managed to save two-thirds of the pier. Fire Minister Penny Mordaunt will meet residents and community leaders in Eastbourne "as a priority" following the blaze. 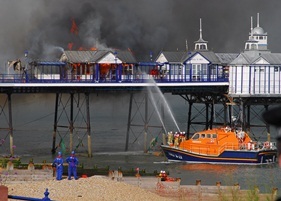 The RNLI sent lifeboats from Eastbourne, Hastings and Newhaven were sent to the pier to help firefighters tackle the blaze which was eventually brought under control shortly before 8pm. CFO Prichard added: "This has been an extremely challenging incident. Our firefighters have worked very hard in difficult conditions to stop the fire from spreading. "Sadly one building on the pier is now a shell and other smaller buildings have been damaged but the remaining buildings on the pier are being protected. "This couldn't have been achieved without the assistance of a number of other organisations, including the police, Coastguard and RNLI. "This is obviously an upsetting incident for all those who love this landmark. We are thankful that there are no reported injuries and that firefighting operations continue, to try and ensure we save a large part of this iconic pier."